A couple who tried to elope together have been beaten to death and cremated by relatives in an apparent ‘honor killing’ in India’s eastern state of Bihar. Police said they have arrested one person and are searching for others. "The victims, identified as Parvati Devi (15) and Jairam Manjhi (25), were residents of the same village and were in love. Manjhi was already married and the girl's family was opposed to the affair," Gaya district police chief Manu Maharaj said as quoted by PTI news agency. The man reportedly had three children. Police said that after the girl’s relatives caught the couple eloping at the rail station on Wednesday morning, the two were brought before a council of elders. As the lovers were not willing to compromise on their relationship, they were lynched by the angry relatives as the villagers watched and chose not to stop them, according to police. “They mercilessly beat the couple and later burnt their dead bodies outside the village. There were more than 100 villagers present when the couple was lynched,” Maharaj said. "This is a clear case of 'honor killing'. They took the law into their own hands," Gaya's Sub-Divisional Police Officer Manoj Kumar Sudhanshu told Reuters. Police said that they have arrested the girl’s aunt and are searching for 14 other relatives involved in the murder. 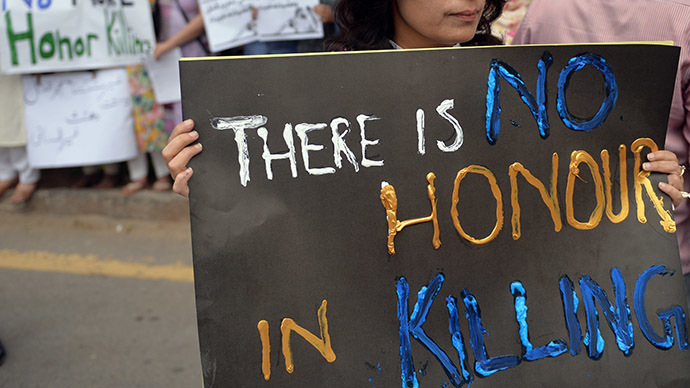 Honor killings are carried out by family members who believe the victim has brought shame to the family and are still common in parts of South Asia, particularly in Pakistan, Afghanistan and some Indian states. In 2011 India’s Supreme Court ruled those involved in honor killings should face the death penalty. Though there are no official statistics on the number of victims, according to UN estimates made in 2010 over 5,000 honor killings are reported to take place every year.